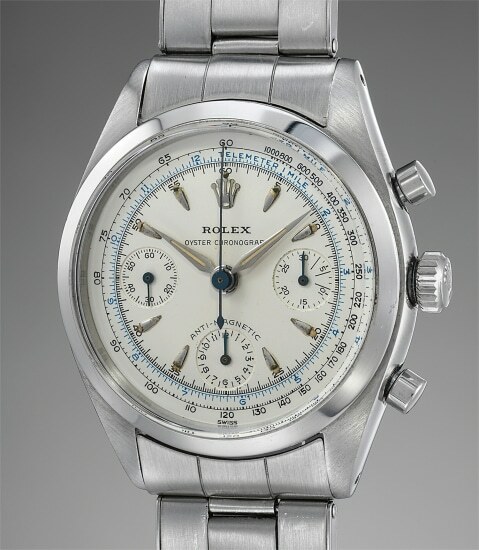 The present watch demonstrates how a watch can remain extremely original, even sixty years after it has left the Rolex factory. This particular case is presented in extremely remarkable condition. It features full proportions and sharp finishes on the top of the lugs. The numbers between the lugs are particularly noteworthy. Deep and precise, the serial and reference numbers are engraved directly onto the factory-satin finish, demonstrating how they have never seen intervention in the past. The bezel is particularly crisp, with a sharp edge. The "Swiss"signed dial is equally extraordinary, with no major signs of tarnishing, which is impressive given the age of the watch.